Lead the most impressive flock through feeding, nest building and hatching. Selecting the actions is simple, but when one bird flies, so do all the others! Can you time your actions to take advantage of when the flocks fly? 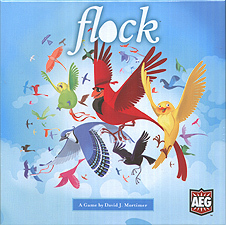 During the game, players try to expand their flock with the goal of scoring the most victory points after three rounds of play. Victory points are scored by controlling the action cards at the end of each round. Also, be sure to have enough tasty worms to feed your birds at the end of each round, otherwise they will fly away. Will your flock be on top of the pecking order?